All showings are by appointment only.This is The Best Priced real 3 bedroom 2 bathroom duplex condo in the 3 villages of Downtown Manhattan! This rarely available large 1261 SQFT townhouse style condo in turnkey condition offers an open chef's kitchen with granite counter tops, solid wood maple cabinetry and stainless steel appliances, 2 tastefully done full bathrooms, tons of storage spaces plus a California walk-in closet in the master bedroom, and a utility room with in-unit washer and dryer. There are 2 floors for this home, the practical and flexible floor plans offer big living space across two full levels, South and North exposures provide excellent ventilation, complete with the amenities you would find in a suburban single family home without having to leave the city. 7 closets through out the home provide abundant storage spaces. Built in 2001, this classic building sits on a peaceful tree lined street in East Village, Manhattan's most authentic, Bohemian, and artistic neighborhood that is full of life, and with abundant restaurants of world cuisine, unique cafes, vintage shops, and a haven for galleries and artists that created ground breaking art and music. No other true 3 bedrooms and full 2 Baths are available at this price point! It is close to everything you need, the 14th Street L line subway train station, the newly opened Target on Avenue A and 14th Street, Trader Joe's, and Union Square. The Tompkins Square Park is just one block south, which is like a Central Park of East Village, occupying 3 whole blocks, and provides all sorts of facilities in the park, including a basketball court, squash court, restrooms, dog run area, fitness facilities, children's play area, outdoor mini-pool, and free Wi-Fi. Tompkins Square park was named "The Best Dog Parks In NYC". If you like riverside, the East River State Park on the waterfront is only 2 blocks to the East, providing a wonderful place for jogging, walking, and picnic with friends and family, there are also baseball court and football court in East River State Park, as well as children's play area. St. Marks Place, which is famous for numerous great Asian restaurants, cafes, bars, and shops of East Village are all nearby. This home is also in walking distance to many great universities and colleges, including New York University, Parsons School of Design, School of Visual Arts, Baruch College, The Cooper Union, and Saint John's University, providing huge rental demand from students. The vacancy rate is extremely low in the area.Transportation is always easy, you have easy access to 8 subways lines including L, 4, 5, 6, N, Q, R, W, also many bus lines such as M2, M3, M8, M15, M101, and M102. 14th Street will become a busway in 2019, providing fast transportation. 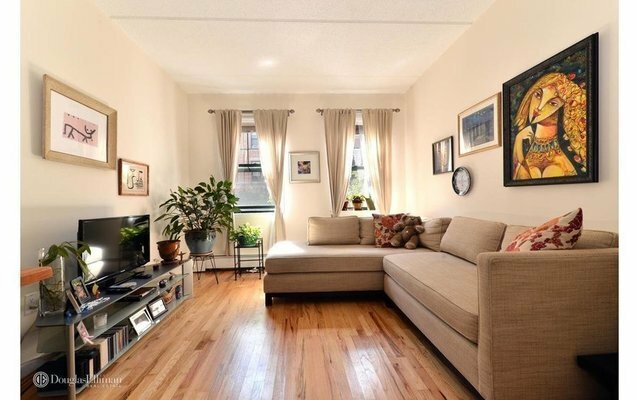 Enjoy the vibrancy of Manhattan's East Village with the benefits of a townhouse-like home, it is perfect for you as a primary residence, pied-à-terre, or just a rental property with great return on investment. East Village is the future, this area and this home has huge room for property value appreciation. Please contact Calvin for showing.